The Blackburn R.T.1 Kangaroo was a British twin-engine reconnaissance torpedo biplane of the First World War, built by Blackburn Aircraft. In 1916, the Blackburn Aircraft Company designed and built two prototypes of an anti-submarine floatplane designated the Blackburn G.P. or Blackburn General Purpose. It was not ordered but Blackburn developed a landplane version as the Blackburn R.T.1 Kangaroo (Reconnaissance Torpedo Type 1). 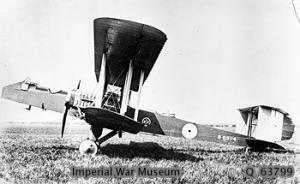 The first aircraft was delivered to Martlesham Heath in January 1918. Test results were disappointing, with the rear fuselage being prone to twisting and the aircraft suffering control problems, which lead to the existing order for 50 aircraft being cut back to 20, most of which were already part built. From the sixth aircraft onwards, they were powered by the more powerful Rolls-Royce Falcon III engine replacing the 250 hp (120 kW) Rolls-Royce Falcon II. The Kangaroo entered service later that year with No. 246 Squadron RAF based at Seaton Carew, County Durham which had six months of wartime operations and they sank one U-Boat, UC-70, which was spotted lying submerged on the sea bottom near Runswick Bay on 28 August 1918 by a Kangaroo flown by Lt E. F. Waring, the U-boat being badly damaged by a near miss by a 520 lb (240 kg) bomb and finished off by the destroyer HMS Ouse, and damaged four others. In 1919, three surviving RAF Kangaroos were sold to the Grahame-White Aviation Co Ltd based at Hendon Aerodrome. Eight others were sold back to Blackburn Aircraft, three being converted with a glazed cabin for its subsidiary, North Sea Aerial Navigation Co Ltd, also based at Brough Aerodrome. Several different configurations were embodied for the civil market, for cargo, pilot training and/or the accommodation of up to eight passengers. In the first few months of 1919, most of these converted aircraft continued to fly (and sometimes crash) in military markings, then the survivors were repainted with civilian registrations and commercial titles. In May 1919, joy-riding, cargo and passenger charters took place at locations including Brough, Leeds, West Hartlepool, Gosport, Hounslow Heath. During August 1919, three Kangaroos flew to Amsterdam for the ELTA air traffic exhibition, and spent several weeks giving flights to an estimated 1,400 passengers. On 30 September 1919, North Sea Aerial Navigation Co Ltd started a regular passenger service between Roundhay Park (Leeds) and Hounslow Heath. In 1920, the company was renamed North Sea Aerial & General Transport Co Ltd, and services were extended to Amsterdam. On 21 November 1919, one Kangaroo (G-EAOW) took off from Hounslow Heath in an attempt to win the Australian government prize of �A10,000 for the first Australian airman to fly a British aircraft from the UK to Australia within 30 consecutive days. The Kangaroo was forced to make an emergency landing at Suda Bay, Crete with a suspected sabotaged engine, and the aircraft was abandoned there. On 8 September 1922, two Kangaroos took part in the King's Cup Air Race from Croydon Aerodrome, but both retired. In 1924, under contract with the North Sea Aerial & General Transport Co Ltd, the RAF used three Kangaroos (named Pip, Squeak and Wilfred after popular cartoon characters) as dual-control trainers for refresher training, but by 1929 the last Kangaroo had been withdrawn from service, and scrapped. Jackson, A.J. (August 1979). "Blackburn's Marsupial". Aeroplane Monthly (London: IPC) 7 (8): pp. 396-402. Lewis, Peter (1970). British Racing and Record-Breaking Aircraft. London: Putnam. ISBN 0-370-00067-6. Blackburn Kangaroo Pictures and Blackburn Kangaroo for Sale.